If you're looking for an actor who can believably play a superhuman genius, Benedict Cumberbatch is your man. Since Sherlock Cumberbatch has displayed his mastery of a) talking very fast, b) being a charismatic prick and c) layering in a streak of humanising vulnerability. So who else do you call when you're casting Alan Turing, a genius prick with a vulnerable steak? The Imitation Game opens with Turing's arrest in 1951 for indecency. This public outing was the beginning of a sad spiral of events that concluded with his suicide in 1954. Within the striplit police interrogation room Turing's skin takes on a deathly white pallor, as if his ghost talking to us from beyond the grave. "Pay attention", he sternly says, "or you're going to miss things." Flashback ten years. Britain is at war with Germany and things are not looking good. With the aid of the famously 'unbreakable' Enigma encryption device the Nazis are able to coordinate surprise attacks across the Atlantic, sending tonnes of crucial food aid to the ocean floor. Britain is starving, bloody from being pummelled by the Luftwaffe and growing increasingly desperate - "we are losing this war". But at Bletchley Park a team of expert cryptanalysts is being formed, their ultimate goal to crack the Enigma code. 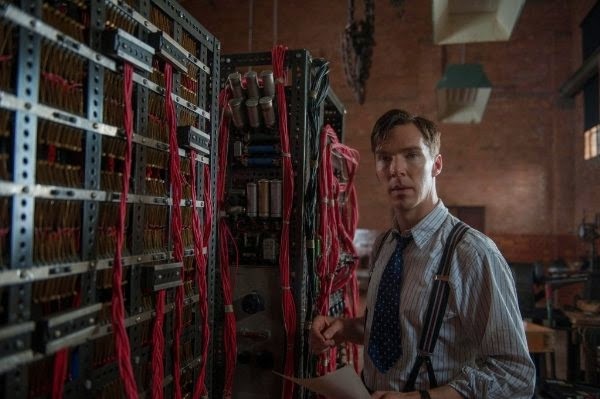 Turing, a man who "loves solving puzzles" is drawn to Bletchley like a moth to a flame, presenting himself to the commanding officer and straightforwardly telling him that his mathematical theories are the only realistic chance of beating Enigma. 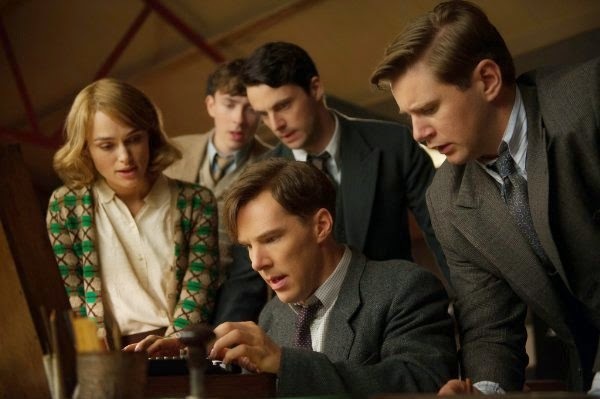 The rest of the film chronicles his time at Bletchley; his rocky relationship with his fellow cryptanalysts; his neuroses about his homosexuality; guilt at the growing pile of wartime dead and his fast friendship with the only person he considers smarter than himself, Joan Clarke (Keira Knightley). For the most part this is riveting stuff. The plot rumbles along at a decent pace, historical details are keenly observed and Tyldum throws in a smattering of clever visual direction (tank treads match cut to spinning computer parts, torpedoes match cut to cigarettes being stubbed out). Importantly, the film goes to great lengths to give the audience the illusion that they're as smart as these characters. Cryptography, high level statistical analysis and mechanical computing isn't the most relatable (or cinematic) subject around, but The Imitation Game is smart enough to know how to communicate what's going on. Most of the time this works. Using the ability to solve crossword puzzles as a mark of intelligence gives us a window into logical problem solving and the script is packed to the rafters with similes that more than outline how huge an endeavour cracking Enigma is. That said there are moments when things are dumbed down a touch too much, a late 'eureka!' moment must be on the first page of Codebreaking for Dummies. It's a delicate balancing act; if we're too far behind Turing's team we can't follow the action, if we're too far ahead they lose their mystique. Slightly more egregious flaws lie in the film nakedly shooting for awards season success. This has Oscar contender written all over it - for the most part deservedly so. But there are moments where Alexander Desplat's overbearing score swells with strings and someone says something really damn corny like "sometimes it is the people who no-one imagines anything of, who do the things no-one can imagine". In a film full of largely naturalistic dialogue, crap like this stands out a mile - dialogue that feels written to be slotted into the trailer (as indeed it is). The nadir is the utterly moronic text that closes the film; "scientists called these devices Turing Machines." (dramatic pause) "We call them 'computers'". Well duh. The Imitation Game's desire for mass market acceptance only truly trips up the film by mandating a rather cowardly depiction of sexuality. Turing's gayness thrums along behind Cumberbatch's performance throughout, but only comes to the foreground in the final act. Unfortunately while the film pays lip service to gay rights it doesn't have the balls to actually show Turing's sexuality. The character, by and large, ends up in a conventional love story with Keira Knightley's character with every act of gay affection taking place firmly off screen. I strongly suspect this omission is made with one eye on the box office; the producers either fearing that audiences won't relate to an actively gay hero or, more pragmatically (and depressingly), knowing showing Turing even kissing another man will earn the film an automatic R certificate from the MPAA, with the resultant reduction in its potential audience. It's a shame that The Imitation Game often feels like it's had its rough edges sanded away, as there's a barrel load of great stuff here. Cumberbatch, though essentially playing a spin on his Sherlock character, is fantastic as Turing and Knightley is comfortably his equal as a genius mathematician. The supporting cast is similarly impressive, particularly Matthew Goode as a suave codebreaker and Mark Strong as a weirdly droll spymaster. It's more than worth seeing, and works beautifully as uplifting, tense and exciting entertainment. But you can't ever shake the impression that these events have been strained through an extremely efficient studio machine designed to filter out every bit of grit and risk. This means that despite the obvious effort and hard work that's gone into The Imitation Game it feels a mite insubstantial. The Imitation Game is released 14th November 2014.